Ghadames or Ghadamis /ɡəˈdæmɪs/ (Berber: ʕademis; Arabic: غدامس‎ ɣadāmis, Libyan vernacular: ɣdāməs, Latin: Cidamus, Cydamus) is an oasis Berber town in the Nalut District of the Tripolitania region in northwestern Libya. Ghadames lies roughly 462 km (287 mi) to the southwest of Tripoli, near the borders with Algeria and Tunisia. Ghadames borders Illizi Province, Algeria and Tataouine Governorate, Tunisia. During the 6th century, a Bishop lived in the oasis, after the population had been converted to Christianity by Byzantine missionaries. It became a stronghold of the Donatist heresy until its conquest by Muslim Arabs. During the late 7th century, Ghadames was ruled by the Muslim Arabs. The population quickly converted to Islam and Ghadames played an important role as base for the Trans-Saharan trade until the 19th century. In October 1911, shortly after the Italo-Turkish War broke out, Ghadames was occupied by Italian soldiers marching from Tripoli. However, Italy's hold on the city was interrupted several times until June 1915, when a general rising throughout Libya caused the Italian garrison to retreat from Ghadames to the stronghold of Tripoli. Effective control over the city was restored in December 1918, but rebellion throughout Fezzan kept Ghadames in a state of emergency until 1923. In 1943, Free French forces occupied Ghadames and its surrounding area in the southern part of the former Italian colony of Libya, forming the Military Territory of Fezzan-Ghadames until Libyan independence in 1951. Ghadames was made the territory's capital during this time. 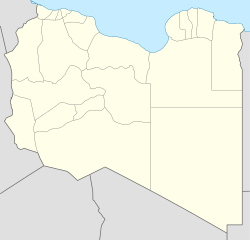 During the Libyan Civil War, National Transitional Council forces entered the town on 30 August 2011, which had been under siege by NTC forces since the beginning of the conflict. Until 2011, the city was under control by independent Tuareg troops. After being captured by the Libyan National Army, the entire Tuareg community was forced to flee in an act of ethnic cleansing. The old town, inscribed in 1986 as a UNESCO World Heritage site, was de-populated of its inhabitants throughout the 1990s, leaving the old buildings at risk of collapse due to a lack of maintenance. It has been listed on the List of World Heritage in Danger since 2016 among four other sites in Libya, because of damage caused by the Libyan Civil War affecting the country and the threat of further damage it poses. ^ "Wolfram-Alpha: Making the world's knowledge computable". www.wolframalpha.com. ^ UNESCO World Heritage Centre. "Old Town of Ghadamès - UNESCO World Heritage Centre". Whc.unesco.org. Retrieved 2018-05-26. ^ Centre, UNESCO World Heritage. "Old Town of Ghadamès - UNESCO World Heritage Centre". whc.unesco.org. Retrieved 2016-07-20. ^ "Climatological Information". World Meteorological Organization. Retrieved December 19, 2012. ^ "Klimatafel von Ghadames / Libyen" (PDF). Baseline climate means (1961-1990) from stations all over the world (in German). Deutscher Wetterdienst. Retrieved 27 March 2016. ^ a b "Ghadames (Ghudamis), Cydamus: the Pearl of The Libyan Sahara". Temehu. ^ Birley, Anthony R. Septimius Severus: The African Emperor. London: Routledge. (2000) . pg 147. ^ "Libyan fighters set to seize border town". PressTV. August 30, 2011. Archived from the original on 2012-10-11. ^ Marozzi, Justin (18 September 2011). "Libyan Tuareg face reprisals" – via www.bbc.com. ^ The World Heritage Newsletter, No.9, December 1995. ^ Centre, UNESCO World Heritage. "Libya's five World Heritage sites put on List of World Heritage in Danger". whc.unesco.org. This page was last edited on 23 March 2019, at 12:24 (UTC).